The City of West Hollywood will celebrate Women’s History Month in March with a series of events to recognize and honor women and women’s history. Throughout the month, a display of street pole banners that commemorates famous American women, civil rights leaders and women’s rights activists will be on display along Santa Monica Boulevard. Two new street banners will be added to the previous collection: U.S. Rep. Maxine Waters and collectively, the Women’s March. Existing street pole banners include: Jane Addams, Susan B. Anthony, Elizabeth Blackwell, Ivy Bottini, Rachel Carson, Hillary Rodham Clinton, Bessie Coleman, Midge Costanza, Dolores Huerta, Mother Jones, Coretta Scott King, Mary Lyon, Wilma Mankiller, Mary McLeod Bethune, Patsy Mink, Inez Milholland, Connie Norman, Michelle Obama, Alice Paul, Rosa Parks, Eleanor Roosevelt, Margaret Sanger, Sonia Sotomayor, Elizabeth Stanton, Gloria Steinem, Elizabeth Taylor, Sojourner Truth, Oprah Winfrey, Harriet Tubman, and Ida B. Wells. –This month the city will be streaming video of groundbreaking female artists whose works have been exhibited within West Hollywood on two electronic billboards located on Sunset Boulevard on the Sunset Strip — one at 8410 Sunset Blvd. and the other at 9039 Sunset Blvd. Artists include: AES+F, Alison O’Daniel, Amia Yokoyama, Amy Jorgensen, Andrea Bowers, Basma Al Sharif, Janet Echelman, Jen Liu, Jillian Mayer, Kate Johnson, Martine Syms, Nancy Baker Cahill, Sita Valrun and YoMeryl. –This coming Sunday, from noon to 3:30 p.m., the city will host a community celebration in honor of International Women’s Day at Plummer Park’s Fiesta Hall, located at 7377 Santa Monica Blvd. . The program will combine the cultural composition of the City of West Hollywood’s Russian-speaking community with many other diverse cultures that make up the West Hollywood community. The event will feature musical performances, presentations, food, and much more. The event is free, no RSVP is required. 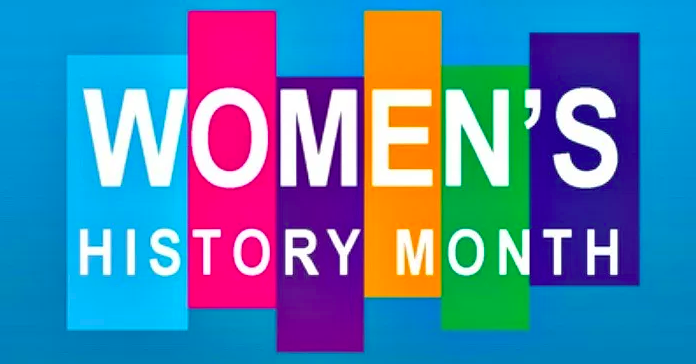 –On Monday, the City Council and the city’s Women’s Advisory Board will host the kick-off of Women’s History Month with a reception and unveiling of two new Women’s History Month street pole banners at the regular West Hollywood City Council meeting. The unveiling will take place at 6:30 p.m. at the City Council Chambers, located at 625 N. San Vicente Blvd. –This month’s Women and Books discussion, which takes place on Tuesday from 7 to 8:30 p.m. at the West Hollywood Library Community Meeting Room, 625 N. San Vicente Blvd., will feature “Anne of Green Gables” by Lucy Maude Montgomery. Women and Books is a monthly book club co-sponsored by the city’s Women’s Advisory Board and West Hollywood Library that meets on the first Tuesday of every month to discuss books written by women authors. Free parking will be available at the adjacent five-story structure with validation. –On March 15, the city and its Women’s Advisory Board will co-sponsor the 3rd annual “Herstory Awards & Reception,” which is presented by the Hollywood Chapter of the National Organization for Women. The event will take place from 7:30 to 9:30 p.m. at the West Hollywood Library Community Meeting Room, 625 N. San Vicente Blvd. Admission is free. Attendees RSVP by e-mail to Hollywood NOW at hollywoodnowchapter@gmail.com or call (323) 596-7389. Free parking will be available at the adjacent five-story structure with validation. –On March 20, 2018 from 6:30 to 9 p.m., the city host a celebration honoring the 25th anniversary of the City of West Hollywood’s Women’s Advisory Board. The event, “From Riot Grrrls to Nasty Women,” will take place at the City Council Chambers, 625 N. San Vicente Blvd. It will feature a panel discussion with Abbe Land, former city council member and founder of the city’s Women’s Advisory Board, as well as current and past members of the board. Panelists will discuss the legacy and impact of the city’s work during the past 25 years in fighting for rights, representation and equality for women and girls. There will be a reception following the program. Admission is free. An RSVP is required and can be made by telephone — (323) 848-6823 — or online. Free parking will be available at the adjacent five-story structure with validation. –On March 28, 2018 from 6 to 8 p.m., the 23rd Annual West Hollywood Women in Leadership Awards and reception will take place at Custom Comfort Mattress store located at 8919 Beverly Blvd. The awards will honor the achievements of local women in the professional and commercial/industrial business community. The event is co-sponsored by the City of West Hollywood’s Women’s Advisory Board and the West Hollywood Chamber of Commerce. Admission is $15; proceeds will benefit the Los Angeles LGBT Center. More information and ticket purchases are available online or by calling (323) 848-6823. A full schedule of Women’s History Month events, and City-sponsored programming in the City of West Hollywood, is available online at www.weho.org/calendar. –On March 22 from 7 to 8:30 p.m. the city’s WeHo Reads program and Book Soup present Chelsey Johnson in conversation with Carrie Brownstein (“Portlandia,” “Sleater Kinney”), discussing and signing her debut novel, “Stray City,” a novel about rebellious youth, inconceivable motherhood and the complications of belonging. The event is at the City Council Chambers, 625 N. San Vicente Blvd. Tickets are $27 plus tax and include one copy of “Stray City” to be received at check-in. Tickets can be purchased online. –On March 25 at V Wine Room, 903 Westbourne Drive, Five Senses Tastings and the League of Women Voters of Los Angeles will celebrate Women’s History Month with “A Woman’s Voice,” a wine, chocolate and music tasting event. There are two show times — one beginning at 4 p.m. and the other from 6:30 to 8 p.m., both featuring live music performed by professional classical, jazz and pop musicians with each pour, while exploring the lives of four iconic women: Eleanor Roosevelt, Rosa Parks, Dolores Huerta and Malala Yousafzai. Tickets ($55) can be purchased online and include four flights of boutique wines and hand-crafted chocolates and live entertainment. — On March 27 from 7:30 to 9:00 p.m. the “Women In Film Speaker Series” will host a panel of filmmakers to discuss how they’ve carried their messages beyond the screen to urge involvement from viewers in response to social issues and injustices. “Women In Film” is a nonprofit organization dedicated to promoting equal opportunities for women, encouraging creative projects by women and expanding and enhancing portrayals of women in all forms of media. The panel discussion will take place at the City Council Chambers, 625 N. San Vicente Blvd. Details can be found online. West Hollywood celebrates Women’s History Month like no other city, which makes me proud to be a resident!